Beautiful blue haired Karou finally knows her true identity, but it has brought her no peace. Instead, she has been convinced to help make living killing machines for a war she doesn’t truly believe in and knows deep in her heart is impossible to win. Still she toils on, the memories of her deceased family members always in the front of her mind, guiding her hands as she continues Brimstone’s work. Meanwhile, miles away on the battlefield, the Misbegotten seraph Akiva still dreams of his lost love, even though he believes that both she and any hope they ever had for ending this ceaseless war are dead. But their love has changed him and he can no longer willfully participate in the chimera genocide. Is it possible for Akiva to overthrow the Emperor’s murderous plan? All he knows is that he must try, if for nothing else but the bittersweet memory of his beloved. Have no clue what I’m talking about? Start here. For those of you in the know, prepare yourselves for the lush, violent sequel to one of the most original fantasy series in recent history. More gorgeous world building, more pages, more drama, more blood, more treachery, more heartbreak, more, more, MORE! (It’s Laini Taylor, ya’ll. 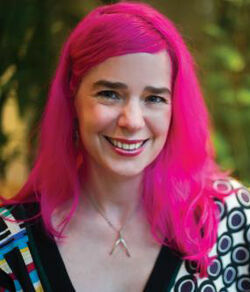 She of the hot pink hair, epic story arc and velvet prose. Did you think it could ever be LESS?) Don’t expect closure–Book 3 is in the works and while I was left satiated for the moment, I am already salivating for the next volume. At any rate, to say any MORE would give away stunning secrets that are best left for your own delighted discovery when DBAS comes to a library, bookstore or e-reader near you November 2012.